The 4x60 Phantom Gen 3 Night Vision Riflescope with Quick-Detach Mount from Pulsar features a 3rd generation intensifier tube with resolution of 57-64 lp/mm, a 101.5mm f/1.69 lens system, a 9° angular field of view, a 8.7 yd minimum focus, a 60mm eye relief, and +3.5 to -3.5 dioptric adjustment. It also features a red Mil-Dot reticle with adjustable brightness and a low battery indicator. When compared to 1st and 2nd generation tubes, this 3rd generation intensifier tube offers significant improvements in image resolution, brightness and provides softer tones of green. To help you account for wind drift and ballistic bullet drop, there are windage and elevation adjustments with 1/2 MOA impact point correction. The riflescope operates on a AA or a CR123 battery. The duraluminum and glass-filled nylon composite housing is lightweight, water resistant and fogproof. It allows mounting this night vision riflescope to a barrel via an integrated mount that fits either a Picatinny or a Weaver rail. 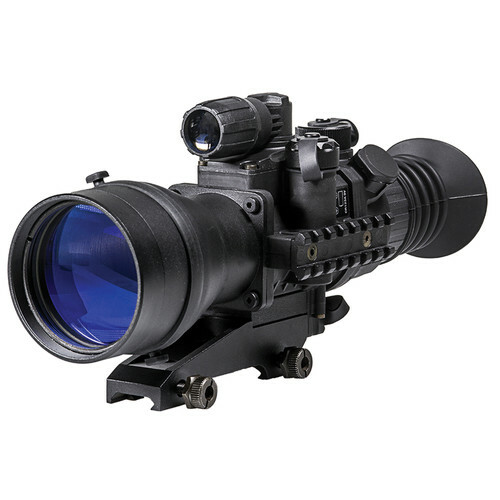 If you need to use other accessories like laser pointers, cameras or flashlights, this scope is supplied with a side Picatinny accessory rail. The battery compartment cap, diopter ring, and windage and elevation adjustment knobs are knurled to ensure comfortable slip-free adjustments even when wearing gloves. The included objective lens cover is tethered to the housing to prevent loss. The wide compressible rubber eye cup covers the entire orbit of the eye to prevent leakage of green intensifier light and to help protect your eye from the recoil. Also included with this NVD, are a hard durable carry case, remote control, cleaning cloth, and a removable IR illuminator.